I was gonna post this on the Winter Solstice, in the depth of the cold and gray…but now it’s just gray. Not so cold. Still…enjoy this memory of summer past and think of summer on its way. She lounges on her back patio, her skin soaking in the last sparkling rays of sunshine as the sun makes his way to his evening engagements. Eyes closed, she breathes in the warm late summer air, catching the faint juicy scent of the tomato plant nearby. Small ripe yellow tomatoes the shape of tiny gourds dangle from the plant, their flesh glowing and translucent in the late afternoon sun. She reaches an arm out and plucks a tomato, feeling its firm skin, still very warm from the heat of the day. 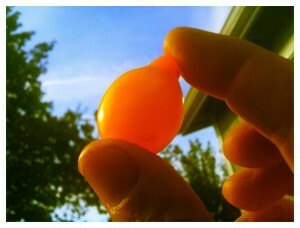 Holding the tomato up to the light, its veined interior glows darker against the bright yellow. She places it in her mouth and slowly bites into the ripe flesh, the skin resisting her teeth causing a small explosion of slightly sweet, slightly tangy juice to erupt against her tongue. I wrote this in the summertime. I saved it for the wintertime, so I could remember what summer feels like when it’s cold and wet and rainy outside. This entry was posted in Food, Literary Pursuits and tagged backyard, salad gardens, summer, winter solstice by Morgan. Bookmark the permalink.